In the face of modern urban political, economic, social, and environmental challenges, interdisciplinary collaboration between professionals, data-driven research, and holistic design will become increasingly crucial to sustainable urban planning. Fascinated by the educational opportunity this context presented, in 2011 I co-founded the Global Urban Development Program (GUDP) at Stanford University as a project-based learning experience challenging students from different disciplines and educational backgrounds in virtual collaboration and systems thinking. However, in 2013 I met somebody who inspired me to realize the real-world value of the students’ efforts. That person was Michael Tubbs, who at the time was just one year into his position as the city’s youngest-ever councilmember representing his own District 6, comprising much of South Stockton. We were both presenting at the 2013 TEDxStanford conference, I about building sustainable homes, he about building city government. I still clearly remember the night before the conference when we met at a speakers’ dinner; after throwing ideas back and forth about how urban blight affects quality of life in Michael’s South Stockton community, he invited me to visit Stockton one day and see it for myself. 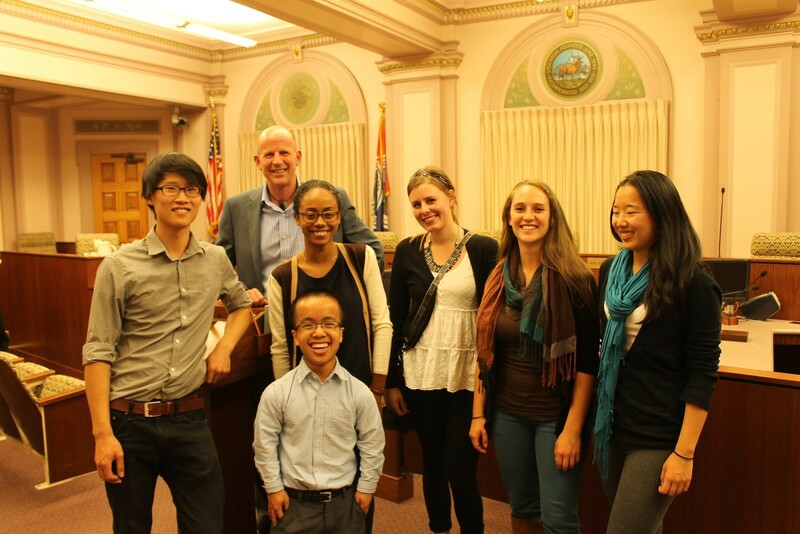 Last Thursday, April 9th 2015, about seven months after that first trip to South Stockton, I brought with me five students (along with two from Slovenia remotely checking in) and my faculty advisor Glenn Katz to present the culmination of our work to the Stockton Planning Commission. What we had found was that, despite those decades of neglect, decline, and misuse that had evidently blighted the community, there was nothing but potential and opportunity in its future. The broader approach of GUDP, as it has developed, is to explore the potential for a multidisciplinary, multiscale, and multifunctional methodology for urban planning — in other words, a science-based urban planning. In this light, our project was divided into two major phases: Research and Design. The Research phase attempted to diagnose the quality of life (QoL) in South Stockton through the combined lenses of Place, Movement, Environment, Health & Safety, Youth & Education, Housing, and Economic Development. Often these sectors are separated into silos of governmental departments and commissions without clear channels of communication of coordination in terms of overall impact on QoL. Our approach in GUDP is to consider these all holistically, measure them consistently, and interpret them synergistically in order to understand which areas of the city are critically stressed by multiple conditions, and why. This research culminated in a single table of Target Goals which identifies key metrics of QoL as a current measurement and a future projection. In other words, this kind of table is demonstrates gap analysis of the most impactful issues affecting South Stockton and turns them into quantifiable problems which are validated by objective data rather than tossed around in political rhetoric. This analysis also allows us to begin identifying tangible and feasible solutions which can be designed to have strategic impact across multiple metrics or areas, and furthermore, can be implemented and tracked with results-based accountability. After the Research phase, the students were asked to form new teams and propose unique design projects of their own choice which focused on a set of indicators they had analyzed in the Research phase and presented an innovative approach to closing those gaps through macro or micro projects, policies, and programs. The first project, Industry Revitalization, presented three industries (food processing, tire recycling, logistics) which could be developed in South Stockton through governmental facilitation and provide valuable job opportunities and economic growth for the community. The second project, Environmental Resiliency, designed an affordable energy-efficiency retrofit program for old homes in South Stockton that is driven by community volunteering and clear payback incentives. The third project, Airport Way Revitalization, proposed the revitalization of 19 vacant lots along Airport Way into a neighborhood center over the next twenty years, beginning with DIY, affordable temporary structures and gardens, followed by a community center, and completed with new commercial development. The fourth project, CSU Stockton Proposal, presented strong evidence of the economic and social benefits of developing a CSU Stockton campus in South Stockton. Each of these projects were presented to the Planning Commission on April 9th, and more detailed design reports including drawings, figures, and feasibility studies will be published online in the next few weeks. 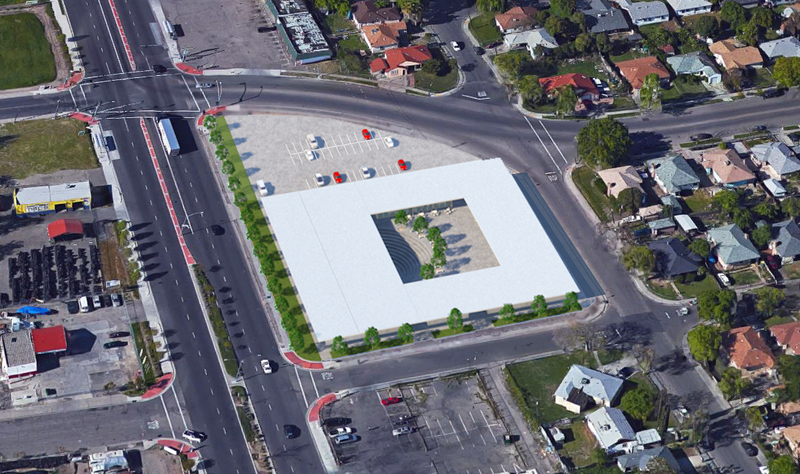 Rendering of proposed community center on 8th and Airport Way. Credit: GUDP. Of the various learning goals of GUDP, including online teamwork, interdisciplinary teamwork, systems thinking, and research methodology, perhaps the most important one is human-centered design, or participatory design. The students were introduced to this concept with the help of the Stanford Haas Center for Public Service, which provided them with its Principles of Ethical and Effective Service as well as a grant for service-based learning. The students used this funding to travel to Stockton many times throughout the project and organize a community engagement activity on February 7th, in which citizens from the neighborhood came and provided their local insights on the problems their neighborhood faced, as well as ideas for revitalization which were incorporated into each of the design projects. If we had more funding, I would have loved for the students to engage the community more times in both the Research and Design phases, because I think this is the most critical aspect of making urban planning successful. If we are to design a truly sustainable future for cities like Stockton, it will require buy-in and effort from the top-down and from the bottom-up. I believe our GUDP project has provided one example of how this might look in practice. While we produced a lot of insights and ideas in this GUDP project, I’m most excited about the possibility of continued collaboration between the City of Stockton and academic institutions around the world. This first partnership has shown us that students all around the world can care deeply about a community unlike their own, as well as pool together their various talents and backgrounds to produce innovative ideas grounded in political, economic, and social reality. In fact, many of the ideas that the students proposed can be implemented within a year through governmental encouragement and a small amount of funding, and some of the students and I would love to work with community partners this summer to push forward our ideas. I think this example presents a promising future for what collaborative, scientific, and community-driven urban planning could be, and I look forward to organizing more and more projects for Stockton in the years to come. 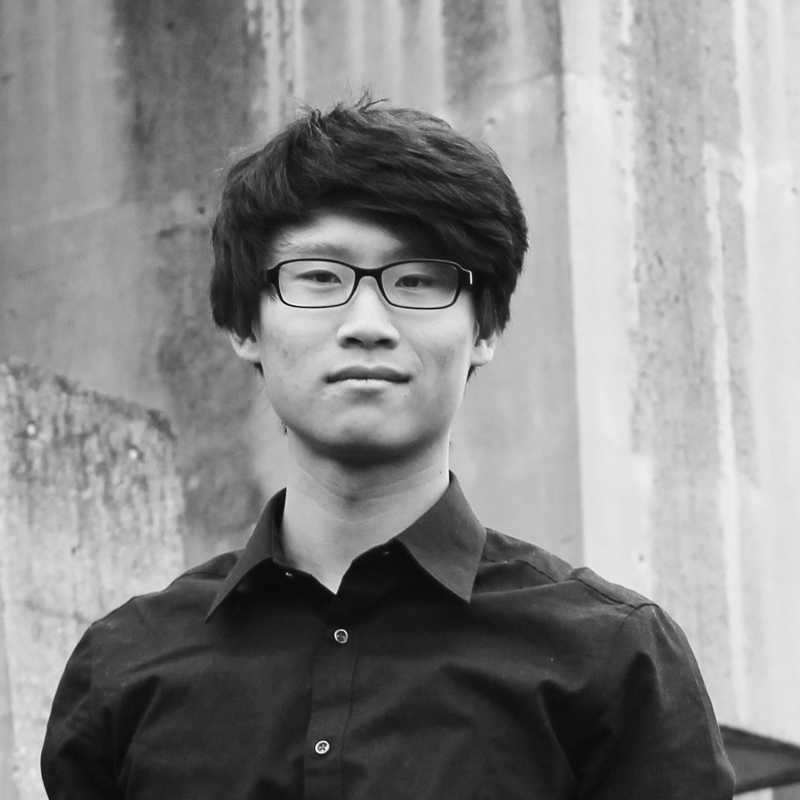 Derek Ouyang, age 23, graduated from Stanford University in 2013 with dual Bachelor’s in Civil Engineering and Architectural Design, and is currently completing a Master’s in Structural Engineering. He participated in the AEC Global Teamwork Project in 2011 and co-created the Global Urban Development Program in 2012. He was project manager of Stanford’s first-ever entry to the U.S. DOE’s 2013 Solar Decathlon and has been featured as an up-and-coming architect in the Los Angeles Times, in Home Energy magazine’s “30 under 30”, at TEDxStanford and Stanford+Connects NY and Seattle, and at fiiS 2014 in Santiago, Chile. All presentations, as well as plenty of additional information, are available at gudp.stanford.edu. It’s wonderful that the Global Urban Development Program has landed in Stockton along with the intellect and creative minds from around the globe. If there is one thing that came to mind if what Stockton has lacked in past years of redevelopment is the absence of fresh creative intellectual talent that could take on planning issues that plague the city. Too many times have I not only read about but also seen with my own two eyes, the product of poor city management in regards to planning and neighborhood blight issues. The Airport corridor is a great example of opportune location and visibility as it will continue to grow into a much more important connection to the growing South Stockton, French Camp, Lathrop, and Manteca region. But there are many areas in Stockton that seem to suffer from the same isolation and disconnection to the rest of the city. Places like East Stockton, Weston Ranch and more and more North Stockton (in all of its fortress-style neighborhood glory). I really like the idea of improving connections through developing both highly accessible roads and developing along these corridors with a concentration of commercial and residential uses; and in Airport Way’s case also industrial development. 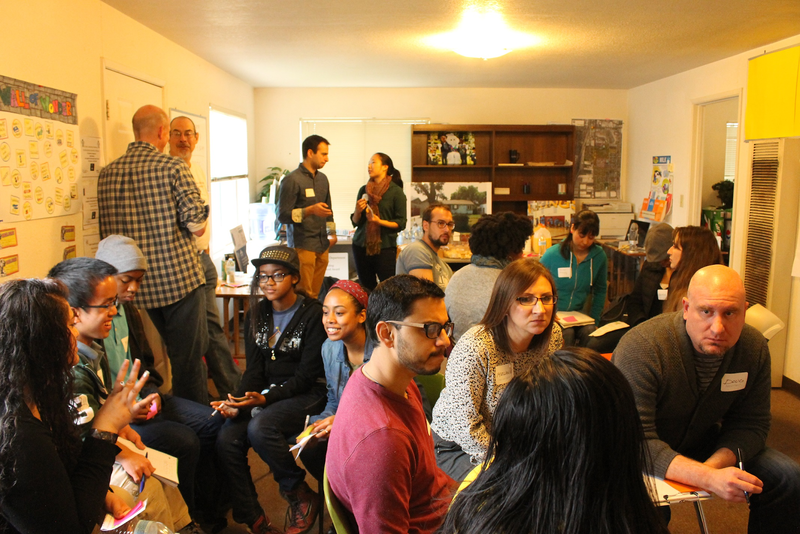 The ideas brought forth by this group of GUDP students was in line with the needs of local residents that have historically been ignored or forgotten about. So kudos to the students of the GUDP, Councilman Tubbs, and the others involved in this wonderful project. The biggest challenge Stockton faces is itself. Stockton’s leaders have promised so much but at the cost of bankrupting the city, as we have all bear witness. But more important than the cities planning and redevelopment failures are the ethics behind the cities management itself. 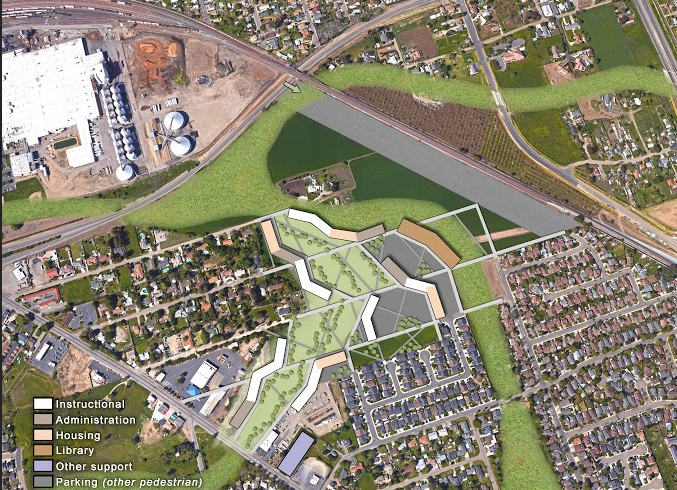 Will Stockton leaders really ever fully embrace sustainable, inclusive and progressive urban development? If the city fails to realize the potential in every neighborhood and how they all play an important role in the overall health of the city, then Stockton will never fully blossom into its rightful place as one of California great cities. This is very exciting. And I’m so relieved to see a possible location proposal for the new CSU-Stockton Campus in a greyfield/brownfield redevelopment zone within the city limits and on MLK Jr. Blvd. (Charter Way), rather than constructing it in the distant agricultural virgin greenfield outskirts of the city beyond the suburbs, like what was done with CSU-Madera. Also, there are some other good candidate locations for the urban campus that can be located closer or near to downtown as possible alternative back-up options, if not for another future institute, say a biomedical university. These might include the north side of the Stockton Channel along both sides of Fremont Avenue, west of the city stadium/arena and events center and across from East Port Stockton; or located in the huge lot across from Louis Park at the Westend Channel on the Embarcadero and across from West Port Stockton that was identified by David as the “North Channel Infill” in his article entitled: “The Top Infill Sites In Stockton That Are NOT Downtown”: https://stocktoncitylimits.com/2015/01/28/the-top-infill-sites-in-stockton-that-are-not-downtown/ ; or possibly located in the depressed and aged industrial district south of the Cross-Town 4 Freeway (obviously to be rezoned as a de-industrialized zone) between El Dorado and Center Avenues westward to the I-5 and north of the AmTrak rail corridor along old Taylor Street, and including the entire Mormon Slough region that can be reclaimed, cleaned up and transformed into a vast central campus and city urban recreational park with a central charming running brook, cascades, bike trails, pedestrian walks, picnic groves, outdoor amphitheater, playgrounds, meeting plazas and squares, botanical gardens, library gardens, concert pavilion, and so on, producing a major community amenity for all citizens to enjoy. CORRECTION: In my opening paragraph above I meant to refer to the University of California Merced, which was constructed in the outskirts of town. What you are proposing Derek is amazing and so very much needed for Stockton. I was born and raised in this city and have only left to do my civic duty of being in the Marines and to live in the town my parents were born and raised down in Central Mexico for half a year. Other than that, I pretty much have been here in Stockton and even though it is rated as one of the most dangerous cities in the nation to live in and was named as the most miserable city to live in by Forbes Magazine, I still wouldn’t live anywhere else. This city is where my heart was formed and has been broken and has been filled with love so I wouldn’t go anywhere else. I always search online for future planning in Stockton because I want so much for my beloved Stockton to recuperate and grow strong to be the same as we were when the Gold Rush Era was goin on and we were the Port City and gateway to everyone coming to search for Gold in hopes of making it big. I am not the best writer as you can tell but I wanted to explain as best as possible how much your efforts mean to me and the City of Stockton and as that you call on me if you need help for anything. I am currently unemployed because 8 became Diabe tic but I’m in control of that now and actively searching for work. However, if you have a position available for me to assist you with your endeavors then I’d be so happy to help. I have a degree in Business Software Applications and graduated with honors. I’m currently training people in weightlifting and fitness as a side job to get by and have the ability to make all my time free to work with you and the students who help you. Please feel free to Contact me anytime Mr. Ouyang. My email address is Hernandez95205@gmail.com. My cell number is 209-565-7990. I live in Stockton and I have reliable transportation. I am fluent in Spanish as well in case that can help the cause in anyway. Thank you very much for your time. Hope to hear from you soon Derek.